What happens on Pancake Day? How do the British celebrate Halloween? And why is the London Marathon one of the UK’s most popular sporting events? 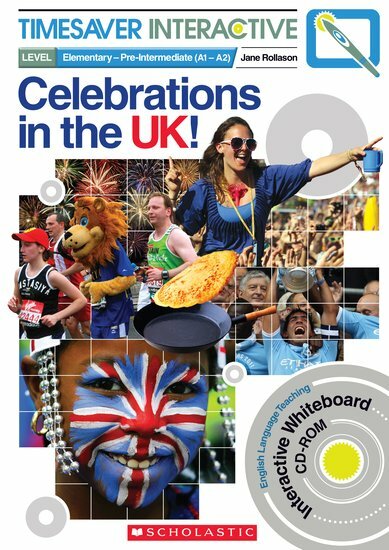 Teenage classes will love this rich interactive whiteboard resource that presents the key festivals and events in the UK through a variety of fun interactive activities. Timesaver Interactive is an exciting series of interactive whiteboard materials for use in the English Language Teaching classroom. Each title contains twelve ready-to-use lessons, all packed with motivating activities, aimed at teenage learners and designed to exploit the potential of the interactive whiteboard. Student worksheets and full teacher’s notes accompany each lesson. We know teachers are all very busy and we want to help and support their work in every way we can. By watching the video tutorial you can see how to fully exploit our digital resources for the interactive whiteboard and bring your lessons to life!